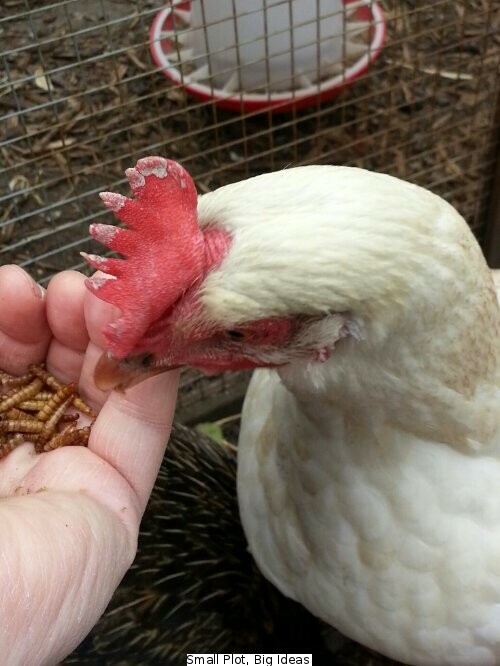 No, this isn’t the title of a new Robert Ludlum novel – just a post about some recent chicken problems! We have been very lucky with the health of our 3 chickens and in just over one year there have been no major problems at all. I wouldn’t try to claim this is the result of any expert attention of our part or any deep-rooted animal husbandry skills. At best it’s just a sign that we’ve obviously not been making a complete mess of things so far. Until recently the most worrying situation we have had was what we call a “jelly egg” where the shell is to a greater or lesser extent missing from the egg. This has been a fairly rare occurrence and usually within a day or two the hen in question is back to normal again so it’s never been a great cause for concern. Unfortunately the other day I spotted some white crusting which I hadn’t seen before on the comb of one of our hens. This led to an entertaining if slightly disconcerting evening of researching chicken ailments on the internet. The most likely cause I could find was a fungal infection called Favus which by all accounts isn’t immediately life threatening. As far as I could tell we had caught this at the very early stages so the treatment should be straightforward. One of the best bits of information I found on this was this page at the OrganicVet web site. which has treatment recommendations Another helpful forum post at Allotment.org also recommended the use of miconazole (as found in Daktarin athletes foot treatment) so off to the chemists we went! It turns out that chemists keep Daktarin behind the counter and they check with the customer before selling it. I’m not sure I understand why but that’s just the way it is apparently. Not such a big deal you would think but in the first shop we told them it was for treating a chicken and they wouldn’t sell it to us! We immediately learned that lesson and were more successful at the next shop we tried. A day or two after applying the cream everything looked to be good but the symptoms were not completely gone. At the same time I noticed some similar symptoms with another hen so we applied the treatment to both birds just to be safe. This seems to have done the trick and there have been no further signs of these symptoms again but I’ll definitely be keeping a watchful eye out in future.